In what seems like an overnight takeover, the Pokémon Go game became a sensation for the masses. Youth and millennials alike have begun to navigate through city centers and their neighborhoods on foot with phones in hand to ‘catch them all.’ With a vast amount of participation all over the nation, the Pokémon theme has reached news stations, social media, and literally, the streets. It has gained so much traction that even grandparents and the elderly are asking about Pikachu. What is Pokémon Go? What is the appeal? And what can a small business learn from a yellow cartoon character? Pokémon Go is a mobile app game that turns your physical location into an augmented reality on your phone using GPS software and the phone’s camera. Characters in the game, called Pokémon which is a coined term derived from the words ‘pocket’ and ‘monsters’, are randomly placed in your physical location and are shown on your phone. The premise of the game is to catch the Pokémon, train them, and use them to fight other Pokémon. The more Pokémon you have, the higher points you can get. In order to understand the craze behind Pokémon Go, you have to go back in time and look at the history of Pokémon! Pokémon started as a game in 1996 on the very popular Gameboy, a handheld video gaming device. It eventually evolved into a card game, an anime tv show, and all sorts of merchandise items catapulting the concept to recognition on a world wide stage. The mobile Pokémon Go game, although very new in 2016 is based off of an older theme which has gradually developed a cult following. In understanding the historical aspect of Pokémon, it is clear that the creators of Pokémon Go are banking on participation from a niche audience that has already been cultivated. They have successfully designed a mixture of nostalgia and new technology to generate an enormous response and ultimately create a movement. Furthermore, Pokémon Go’s creators have used a combination of strategic marketing tactics to gain additional footing in their target market. These tactics can be mimicked on a smaller scale and used by local small business owners in diverse industries with a little creativity and imagination. Let’s take a look at some of these tactics within each of the four areas of marketing. Pokémon Go has managed to offer their product at a very attractive price point, FREE! A portion of their proceeds come from offering special features for gamers who want to get ahead quickly. This premium feature is optional, however users have a major incentive to make a purchase due to wanting to compete well, achieve prestige and honor, and advance to higher levels in the game. Small businesses can emulate this idea by offering free product samples, a free first try, or a lighter version of their product for free while providing an added incentive to make a purchase. Examples of added incentives include discounts, bonus rewards that can be applied to a future purchase, and a VIP experience. A product achieves wild success when it can offer psychological and physical rewards for its users. Pokémon Go does just that by fulfilling nostalgic fantasies of it’s older users, appealing to the gaming tech needs of its younger users, and providing a space to meet new people in the process. Additionally, doing well in the competitive aspects of the game offers players a feeling of success and achievement over other players. This is a classic marketing tactic often seen from major brands like Tiffany Diamonds, Rolex, and Mercedes. Small business owners can also use this concept in marketing by highlighting how and why their products or services can advance their customers ahead of their peers who don’t use the same products or services. Another feature Pokémon Go offers is interesting in that it has a certain appeal of fitness as a positive side effect from game participation. Players must walk around and be active in order to catch Pokémon. Users have commented that they ultimately achieve most of their daily step or walking goals when playing the game. This is an added bonus for users and another reason why Pokémon Go has claimed such a large reception. Achieving fitness goals is a desire most people have and playing Pokémon Go can help accomplish these goals. Promotions for Pokémon Go have largely depended on social media in a couple different ways. Its creators have launched a very effective social media campaign using paid advertisements and hashtags on various networking platforms to jump start exposure. Users have also taken to social media to post images from their phones of capturing or spotting Pokémon. The appeal for users to post about their Pokémon Go exploits is that it’s a lot of fun and they want to showcase what they found to their friends. This offers an added bonus to the game because any amount of organic sharing is beneficial for getting more exposure. 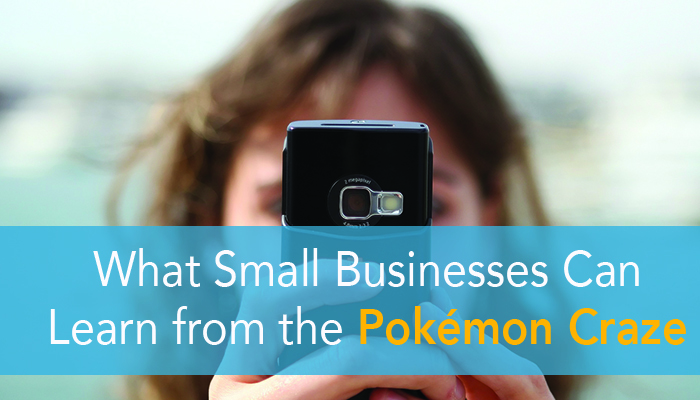 While small business owners can not benefit from their customers sharing a pocket monster, they can however offer a small incentive to their customers for posting a picture of themselves using their product on social media and tagging the business. The game has also earned a great deal of publicity. In addition to a long history of notoriety, Pokémon Go creators have managed to be a forerunner in new gaming technology which sparked a movement that media outlets have no choice but to recognize. A large movement simply demands attention. Pokémon Go has been able to capitalize from this movement they’ve created in garnering a high level of media attention. Another reason why Pokémon Go has earned so much popularity and participation is because of easy access. In order to start using the game, a person only has to download it from the App Store for free and they can start catching Pokémon with just the press of a button. It’s simple. It’s easy to use. It’s accessible to anyone, plus it is available on a system mostly everyone is already accustomed to using. There are no learning curves, no obstacles to getting in, and no requirements. Savvy small business owners are always looking for exciting ways to spark participation and promote their businesses. In studying the Pokémon Go frenzy, we can glean several techniques to be applied on a smaller local scale that might enhance marketing efforts and ultimately increase sales. Thorough market research can yield a better understanding of your target market in order to position your business to be where your customers are. Research of this nature can lead to the ability to capitalize on what a target market is already involved in and can help you craft a marketing message that will encourage customers and prospects to do more of that with your business. Additionally, finding ways to upgrade the user experience to be more stimulating and combining it with other unrelated personal goals can help enhance added value to your product or service. The ultimate lesson to be learned here is that generating a product people want and have incentive to share are keys to sparking a movement.